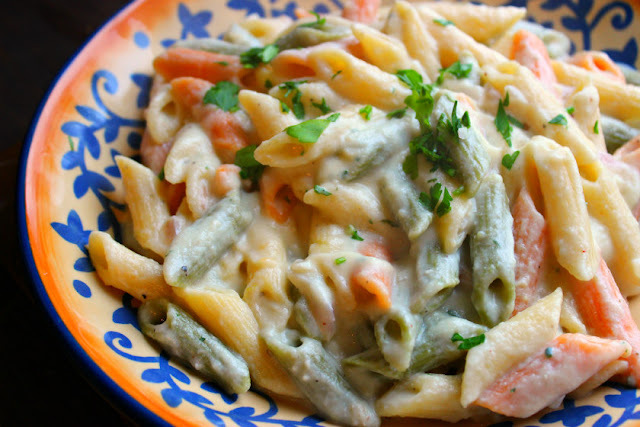 This is a great change of pace from a heavy cream sauce for pasta. I have been seriously watching my cholesterol intake for the past few months, and today I found out that my LDL level is down 26 points! You don't need to take medication if you eat well! There are so many pasta options now - choose your weapon~! 4 cups chopped cauliflower (1 medium) 1-1/2 cups Skim Plus 100% Fat Free Milk 2 Tbsp. Smart Balance Buttery Spread 1 lb. pasta of your choice (I used Barilla Tri-color Penne) 1 Tbsp. Extra Virgin Olive Oil 1 cup chopped onion 2 cloves garlic, minced 1/2 cup dry white wine, chicken or veggie broth Pinch of nutmeg 1 tsp. lemon zest 1/3 cup grated Parmesan cheese 1/4 cup chopped fresh parsley Salt and Pepper to taste. In a large saucepan combine cauliflower and milk. Season with salt and pepper to taste. Bring to a boil, reduce heat and simmer, covered 8-10 minutes or until cauliflower is fork tender. Add cauliflower mixture to blender, add Smart Balance and blend until smooth. Set aside. Cook pasta according to package directions. While pasta is cooking, heat oil in a large saucepan. Add onion and garlic. Cook 2 to 3 minutes or until slightly tender. Stir in wine or stock. Stir in cauliflower puree. Drain pasta, reserving some of the cooking liquid. Add pasta to saucepan. Add nutmeg, lemon zest, Parmesan, parsley and salt and pepper. Toss to coat. Add pasta cooking liquid if pasta seems too dry. Serve warm with additional grated cheese.